I can’t believe it has been so long since I sat down to chat with you. Life got to where it felt it was going out of control back at the end of Spring and I had to simplify life a bit. So let’s see, when last we met Chris was still home on Paternity Leave, Vanya was a wee thing, and I was a stay at home mom trying to find an identity outside of the house. Obviously Chris went back to work and then so did I! I started working for my local bookstore, Page 158 Books, doing our online event postings and some social media work over the summer. Then in the Fall I started working in the store itself on the weekends and hosting one of the book clubs. This really is my perfect job right now. My origin story as a nerd is up a tree with a Narnia book and it feels so good to indulge that side of me again. I’m meeting authors, reading tons of books, and most importantly helping people find the books that speak to them. I love it! Believe it or not Vanya is about to turn one next month. He’s the happiest baby I’ve ever met and into absolutely everything. We feel like we’re possibly days away from him starting to walk. He and Pasha are thick as thieves. There are some serious let’s drive mom crazy teamups happening around here. I can’t believe that I have two little boys running around. I never knew I wanted to be a boy mom, but it really is the best. I knit a few things, but not a lot. I read a ton, but more on that later. I spent soooooo much time with my kids and my family and absolutely loved it. All told, 2018 was a great year and I’m hoping for an even better 2019. Hopefully less stress, more writing, and the same amount of chaos. If you’ve stuck with me through the crazy I can’t thank you enough. I hope you enjoy what I have planned for us this year. Note: all pictures in this post were taken by the amazing Nevada Marie Photography. And yes, all sweaters were knit by me. 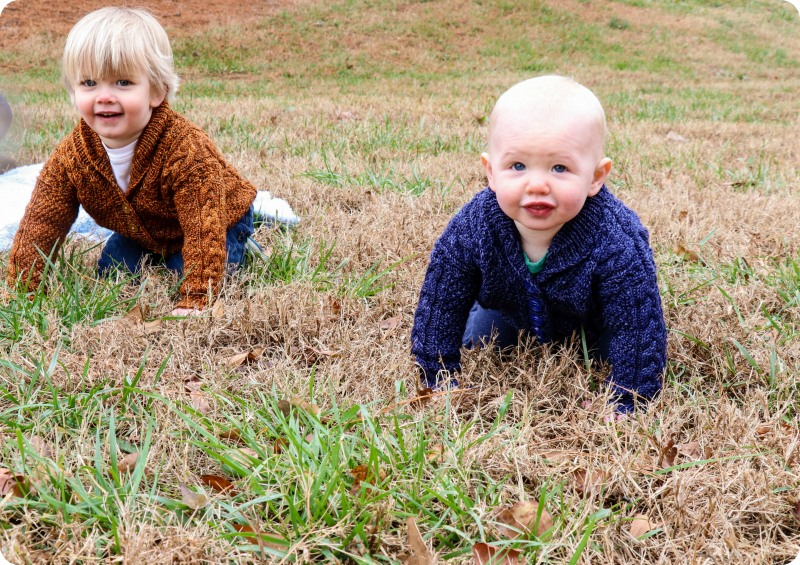 The boys are wearing Jones by Tin Can Knits in Leading Man Fiber Arts DK and mine is Big Sister by Kate Oats in Infinite Twist.